How many of you love your bike and car more than your girlfriend? How much time do you spend cleaning your car or bike every day? For many of us washing your car or bike is not just for cleaning it but a therapeutic. Some of us enjoy cleaning the bike everyday like a ritual. You might forget shaving but the bike cleaning and car washing doesn't stop at any cost. Even on a rainy day. Never mind the back ache after the procedure. If you are one of these cleanliness fanatics like me, this article is gold for you. This Saturday something special happened in Bengaluru. Apart from the rain gods showing their fury on illogical expansion and a bandh for water, it was heaven for bikers and driving enthusiasts to take out their machines for a ride. We all huddled on the drizzling yet warm morning at Royal Orchids to try out the new solution for car and bike washing from Bosch Power Tools India! Now I was in a surprise as we were greeted by a muddy, dirty SUV, hatchback and a bike that begged to be washed. 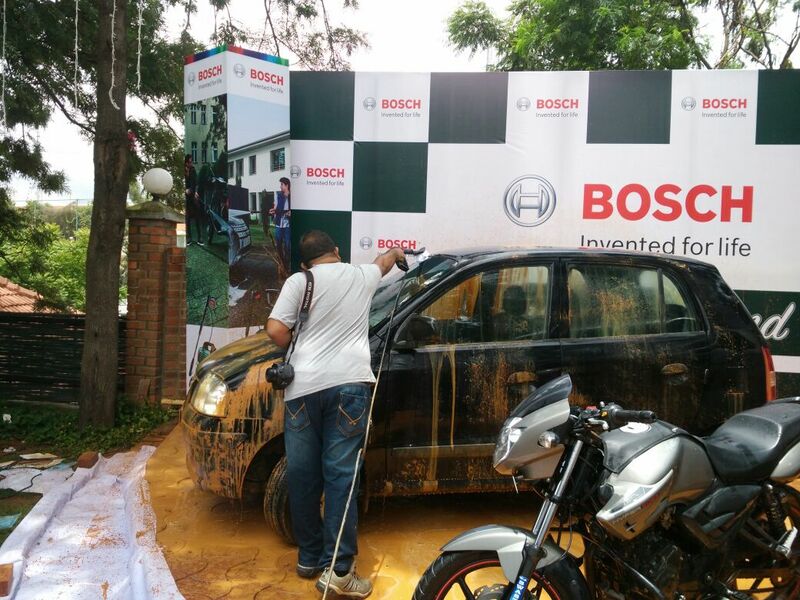 While the controlled smiles of the Bosch team were intriguing enough we were invited to pour more dirt, mud and slush on the vehicles. You should have seen the enthusiasm with which some of us threw wet muddy slush around. Just to remind you they were already dirty and the mud had dried up and this was a fresh coat of mud we were giving them! 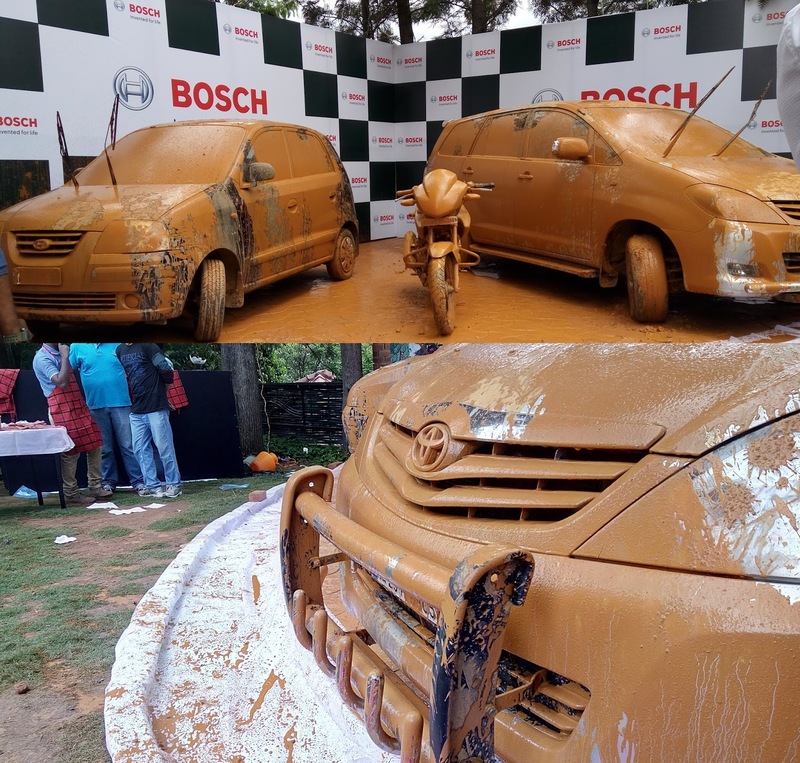 After being merciless and making them muddy to an extent that would make the car servicing guys open their mouth wide open with greed and the owners cringe, the first Bosch machine was unveiled. Now this is a very light weight machinery, you could easily lift it up with your hand. This actually weight less than half a bucket of water! Once the taps were plugged in came out the water guns. I was skeptical as the machine was too small and looked like it would be just like another pump but I was in for a surprise. Once it was turned on the machine started spewing jets of water with such force that would hurt your hand of placed at the nozzle. But to my delightful surprise and a lot of relieved sighs from the crowd, the water was enough to wipe off the dirt including the dried up layer! There were an assortment of brushes and nozzles that would come with the pack and you can easily twist and attach them to the water gun and viola, it cleansed the car clean in no time. You could wash a hatch back from that kind of dirt to a new car in mint condition look in just few minutes. The best part is that it is easy to connect and not at all tiring to use the machines. The smaller size makes it very easy for you to keep them in a corner in your boot and connect wherever you want to! This works wonders especially because it can run from your car battery! Call it German engineering for the Indian conditions. There are many more models in the arsenal to suit your requirements from the number of vehicles you can wash to the pressure you need. 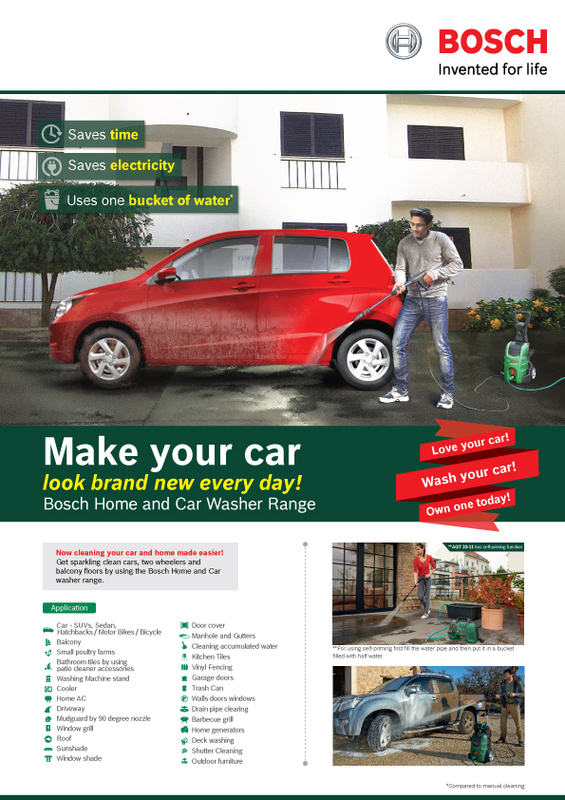 All that and more with the assured quality high pressure washer brought to you by Bosch. 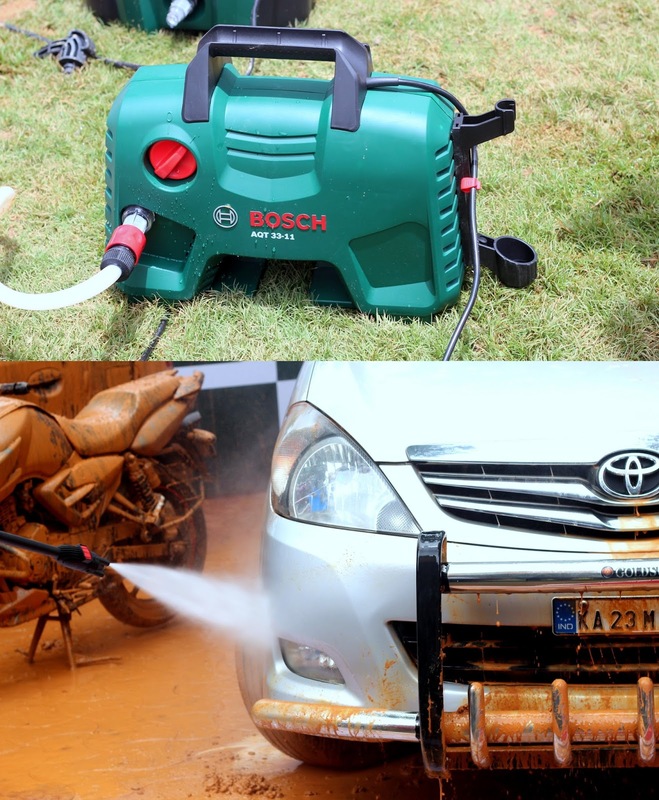 Another amazing thing about these Bosch wonders is that they come in handy when you got to clean your deck, flooring, water gardens, glass facades and many such spaces which need high pressure cleaning regularly. Guess what, the pricing is simple superb and would cost you about a dozen good car washes. Apart from making them pocket friendly, Bosch ensured that they are power saving, water saving and hassle free to use. The HPW AQT 35-12 and AQT 37-13 from Bosch Power Tools are engineered to remove stubborn dirt and can perform in the most rugged of environments. This makes it a tool useful for home and garden purposes. When I tried my hand at washing the hatchback the usual pain areas were so simple to clean. Let me explain. I am talking about the wipers, grill and mag wheels which are the pain points as they end up gathering the maximum dust. By attaching the detergent pot or the 90 degree nozzle to the high pressure washer, I could easily reach these areas and it was kind of fun to get them clean. Why did anyone not think of this before? Bosch High Pressure Washer under the AQT series would be the best way to have fun without getting your hands dirty. Check out the product brochures or walk in to a store to try them out. I would love to have one for the drives in my boot all the time. It is your time to shine with Bosch.